Students from 6th–12th grades and adults within the congregation in three different generations (20-30’s, 40-50’s, 60’s+). 80% of teens raised in the church will disengage by the time they are 29. We want to change this! The Pray for Me Campaign creates the opportunity for teens to connect naturally with adults who will pray for them. We want every student involved in the Pray for Me Campaign to be equipped with everything they need to remain rooted in their faith and connected in the church. 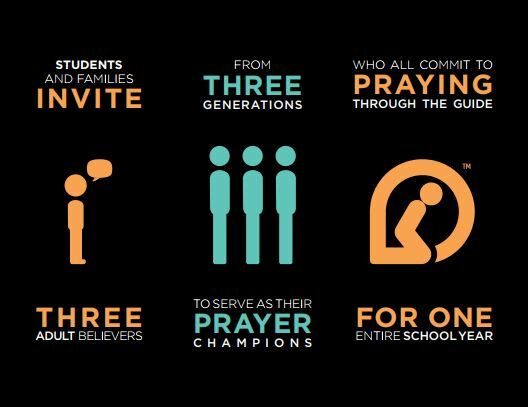 Each student invites three adults from three different generations to be their Prayer Champions for a school year. The student’s invitation builds a bridge from their generation to the next. This creates a web of intergenerational relationships that support students through middle and high school and beyond. Prayer Champions will pray scripture for their student using the Pray for Me Prayer Guide, a tool designed to help adults effectively pray the scriptures over their students for the course of a school year. Thank you for investing your time in prayer. It will be a great blessing to a student! Sign up below to become a Prayer Champion!